When state-run television Fox News publishes poll data like this, there should be absolutely no question about the will of the American people. Yet not a single one of these measures have been put into place. Republican donors, including and especially the NRA, are blocking this legislation with threats to withdraw campaign donations, and politicians who favor dollars over the will and safety of constituents are allowing it to continue. Even more important, we must remember that when it comes to issues related to guns, America is not nearly as divided as Republicans and the NRA would have you believe. 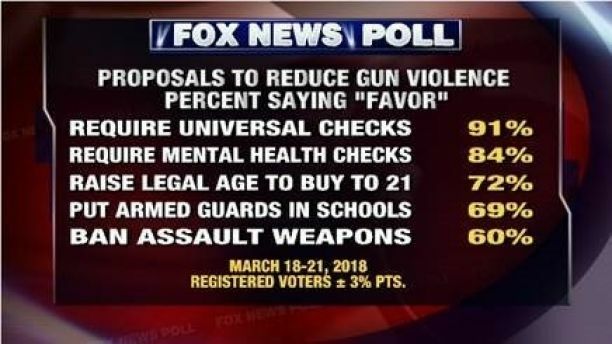 This poll - commissioned and published by Fox News - shows enormous consensus amongst Americans related to these basic, common sense measures. A large majority of Americans want gun reform. Reasonable, rationale, sensible gun reform. It's only a loud, political active minority with money to burn and the gutless, useless politicians who take their money who are preventing it from happening.